When we investigate the Armory Show one hundred years later, we consult the letters of key organizers, and the most important source of information is Walt Kuhn, Secretary of the Association of American Painters and Sculptors that organized the show. Kuhn shouldered a large share of the work on the exhibition, and his letters tell us not only about how the show was developed (including some fascinating behind-the-scenes controversies), but also Kuhn’s excitement and his personal ambitions. 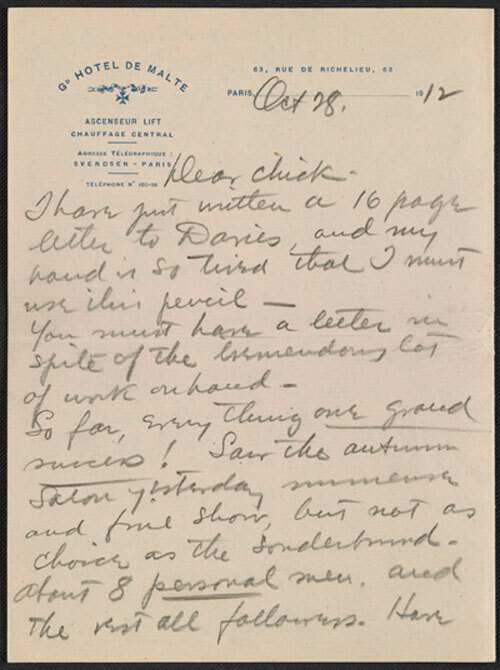 It’s particularly interesting to read Kuhn’s letters to his wife Vera from his trip to Europe in the fall of 1912 to choose the European works for the show. He described his reactions to the Sonderbund Exhibition in Cologne (“Van Gogh + Gauguin great! Cezanne didn’t hit me so hard”), meeting Edvard Munch there (“a tall and nervous sort of fellow”), and his first impressions of the new movements in Paris (“the cubists I must first digest”).1 Kuhn also wrote about how the trip inspired him as an artist: he confided that “my mind is seething with ideas” and “There’s going to be a big change when I get back.” 2 Over the years, however, Kuhn turned away from avant-garde styles and is now best known for his compelling portraits of vaudeville and circus performers. As important as these letters are to understanding the Armory Show, they weren’t available until nearly fifty years later, when Milton Brown consulted them to write his 1963 book The Story of the Armory Show. Until then, the best-known explanation was Kuhn’s own pamphlet The Story of the Armory Show, which he published in 1938, on the twenty-fifth anniversary of the exhibition. Kuhn was no longer sure how he felt about the Armory Show (“my feelings have turned hot, then cold, as to what the whole thing as really meant”) , but he made sure that his role was recognized. 3 Kuhn’s letters are now held by the Archives of American Art, and anyone can read them online and get an insider’s view of this epoch-making event. 1. Walt Kuhn Family Papers and Armory Show records, Archives of American Art, Smithsonian Institution, September 30, 1912, box 1, folder 3; October 2, 1912, box 1, folder 3; October 28, 1912, box 1, folder 4. 2. Walt Kuhn Family Papers and Armory Show records, Archives of American Art, Smithsonian Institution, October 28, 1912, box 1, folder 4; October 29, 1912, box 1, folder 4. 3. Walt Kuhn, The Story of the Armory Show (New York: Walt Kuhn, 1938), 24.